June 12-15, 2019 | Ocean City, MD A great event for all members: Learning & networking for individuals, a team experience for colleagues and fun for vacationing families. Earn up to 15+ CLE credits with the surrounding MCLE states. 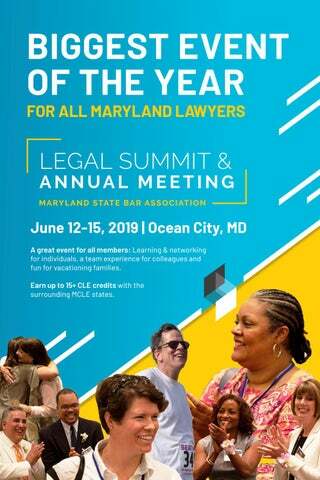 It is our pleasure and honor to invite you to join us at our biggest event of the year - the 2019 MSBA Legal Summit & Annual Meeting - in Ocean City, Maryland from June 12, 2019 through June 15, 2019. Our Board, Sections, Committees, and staff have worked extremely hard to bring you an action packed conference, filled with programs that cater to all members of our legal profession! In addition, there will be great networking, family-friendly and health & wellness opportunities. Don’t miss out on the best combination of learning, connecting and relaxing. Below is a brief preview of our event. We look forward to seeing you there! 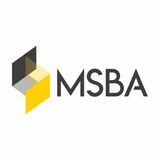 The 2019 MSBA Legal Summit & Annual Meeting will kick-off at 12 noon on Wednesday, June 12, 2019 with pre-conference workshops. At 1 p.m., we will introduce our slate of keynote speakers, including United States Deputy Attorney General, Rod Rosenstein, Maryland Attorney General, Brian Frosh, and CNN Chief Legal Analyst, Jeffrey Toobin. Family friendly events and health & wellness seminars will also be running concurrently. Wednesday evening will feature a host of networking opportunities, including the First-Time Attendees Reception, the Welcome Reception, and a fan favorite, the Crab Feast at Hooper’s Crab House (separate ticketed event - transport provided). On Thursday and Friday, you’ll find a multitude of thought-provoking programs relevant to your practice, your sector of the legal profession, and your career. In addition, we will be featuring a “Thought Leader Series” to provide programming on emerging areas of law, panels highlighting diverse legal sectors, and perspectives on issues facing the legal profession. As always, networking opportunities and family friendly events are weaved into the schedule. Thursday evening will be highlighted with the President’s Reception, and Friday will close with the Executive Director fundraiser “JUST Art” benefitting the Maryland Access to Justice Commission (separate ticketed event, donations welcome). Our Exhibit Hall will open at 12 noon on Wednesday, and continue through Friday at 3:30 p.m. - be sure to visit our many exhibitors to learn how they can help you in your practice and your career. Saturday morning our event comes to a close with the Business Meeting and installation of the 2019-20 MSBA President, Dana Williams. This is an event you do not want to miss. It’s packed full of stimulating speakers, programs relevant to your practice area, sector, and career, and networking, family friendly and health and wellness events. See you at the Ocean! Dancing to music with wireless headphones! Understanding Personality to Achieve Conflict Resolution William Stavros, Esq. Movie will be appropriate for children up to 12 years of age. Popcorn and punch provided. Movie will be appropriate for children up to 17 years of age. Popcorn and punch provided.